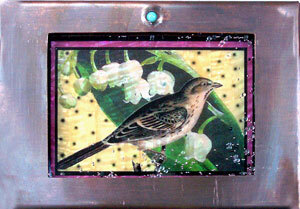 Sparrow and Lily of the Valley Over Pearl, Lid of Box. Copper artist Grace Gunning has treasured the art of memory since she was a young girl. "I've always loved boxes," she says. "I have many from my life. They tend to hold things from the time I got them. As I look into them, I remember that time from my life." For example, one of Gunning's memory boxes holds the Valentine from her fifth grade boyfriend, as well as a Buckeye ring he carved for her. "They are my diaries in objects," she explained. "A personal time capsule." From this simple tradition, Grace Gunning's copper reliquary boxes were born. The definition for reliquary is "a receptacle of relics." Most people are familiar with the term from the Catholic religion. The bones of saints are referred to as relics; their boxes, reliquaries. "People think 'reliquary' is a religious word," Gunning told me. "But no... Saints' bones are relics." In her art, Gunning redefines reliquaries, believing that they can hold any object sacred to a person. This way, memories take on a holiness and live on. The timelessness of copper is perfect for completing the sacred intention of the boxes. Each reliquary is entirely copper and padded with red velvet - like a tiny vestibule in an old church. The metal is smooth and soft; the patina causes it to appear tarnished, the color of antiquity. Originally, Gunning fashioned reliquaries from glass. "I sandwiched fabrics between two layers of glass for the lids," she recalls. "They had somewhat of an abstract landscape feel." After twelve years of making glass boxes, Gunning felt like she needed a change. She started making moon luminaries (candle holders) from copper and fell in love with the metal. "Copper used to be an inexpensive metal," she explains. "That has changed somewhat. But my love for its warmth and ease of working with it has grown." When Gunning switched to copper, she changed her entire manufacturing technique. Through the help of friends, she acquired different machines, dating back to the 1800s, to cut and fold the copper into boxes. It took her six months to learn the process of soldering. Then she debuted the reliquary boxes at a wholesale show. They sold immediately. Today, Gunning takes 25 steps, using different machines and processes, to form the reliquary boxes. First, she starts with a 3' by 8' sheet of copper. Next, she uses a kick shear to cut basic shapes. A notcher cuts right angles into the copper to allow the sides to fold properly. A pan and box break folds the sides of the top and bottom. The window is cut from the lid with a modern scroll saw. To create the patina, Gunning applies a commercial brand from Jax Chemicals. When deciding what to place in the boxes, Gunning chooses objects for personal reasons or because she thinks they might sell. Lately, she's been using graphic images. For example, she combines the image of an antique bicycle with antique kimono fabric. Then she transfers it onto acetate and lays it over pearl. The lid windows are recessed, so there is a little space that has tiny silver and crystal glass balls that roll around on top of the image. "This series is called 'Pearlie Boxes,'" she told me. "They have been selling quite well." Despite her success, Gunning is constantly thinking up new possibilities for reliquary boxes and started making lamps. After visiting the Museum of Natural History in New York City, Gunning found herself "floored" by the dioramas. "Boxes in the fulture will be influenced by this, I'm sure," she said. 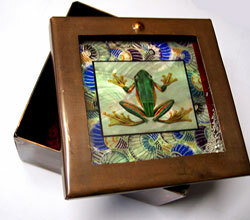 Most interestingly, Gunning has been commissioned to make boxes for the ashes of loved ones or pets. For an artist who began creating boxes for objects that connected her to those she's loved, it's understandable that these would be the most rewarding reliquaries to produce. "It's an amazing process, and a lovely part of my work," she says.